BPO stands for Broker Price Option and is an estimated property value determined by a real estate broker or licensed real estate agent. This type of report is an alternative to a property appraisal by a professional appraiser and is usually ordered by financial institutions such as the lender that holds the mortgage. When a BPO is ordered, the homeowner may not even be aware of the valuation. So how is this different than an appraisal? An appraiser is an estimate of the property's value performed by a certified appraiser and is typically more expensive than a BPO. Where an appraisal may not be necessary, a mortgage lender or bank may opt for this broker price opinion because it's cheaper and these are typically associated with short sales or foreclosures. It's necessary to confirm that the value is lower than the debt owed on the property so a quick drive by and some photos may be able to provide a valuation. BPO's can also be used to trade mortgages on the secondary market or in situations when a mortgage is in good standing. A BPO also gives a and anticipated properties for sale price where an appraisal will give the market value at a particular point in time. Appraisals are considered higher in valuation because it's the opinion of a professional appraiser with the required stringent regulations that appraisers maintain. 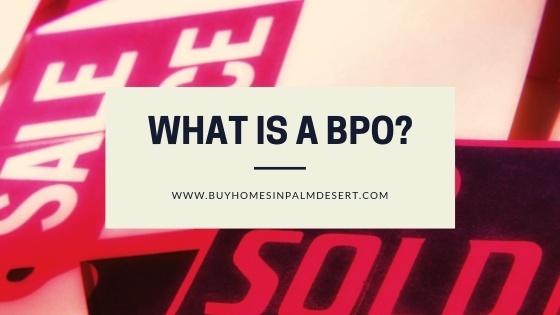 A BPO is calculated by a real estate agent or broker rather than the appraiser and comes from the agent's experience in determining the home's value as if they were pricing it to sell. It does take some skill and lenders will rely on the BPO in a short sale or foreclosure situation. The benefit is that it cost less and can be completed quicker. BPO's typically take anywhere from 1 to 5 days where an appraisal is likely to take up to 10 days or more. Most homeowners don't even realize their home is being evaluated and it can seem a little fishy to have an agent drive by the house and take pictures of the property. You are welcome to ask, however, for your own safety and security. BPO's are calculated based on location, property and structure size, current market conditions, property conditions, and comparables from three recent sales in the area. For more information on a broker price opinion, BPO, or you have questions on your current home's valuation, give me a call today.